This telecentric lens has an integrated coaxial light specifically designed for flat surface measurement and defect inspections. Ideal for electronic and semiconductor Automated Optical Inspection (AOI) and tool pre-setting machines, it features a working distance of 135 mm while ensuring excellent optical resolution, high telecentricity and low distortion, thus matching and even exceeding the industrial requirements for the target applications. The long working distance allows for extra space, which is essential if you need to install illumination, pick-up tools or provide the necessary separation from hazardous production processes. 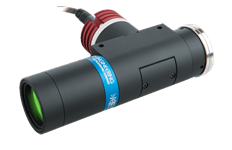 In addition to the long working distance, this lens delivers a numerical aperture large enough to take advantage of high resolution / small pixel size cameras, making these lenses a perfect match for general-purpose 2D measurement systems. Telecentric lenses are the key component of accurate machine vision measurement systems. Unlike conventional lenses, optical magnification remains constant within the field of view and depth of field. This is especially important on the manufacturing floor, where part fixtures and camera triggers are seldom 100% repeatable. The working distance (measured between the front of the lens and your object) should be kept within +/- 3% of the nominal value shown in the specifications for maximum resolution and minimum distortion. The f-number shown is the “working” or “real” f-number of the lens when used as a macro. Please contact us if you need a lens having a different aperture. For the sharpest image, keep the object within half the specified depth of field. The length is measured from the lens's front to its flange. M8 4-pin power cable sold separately.